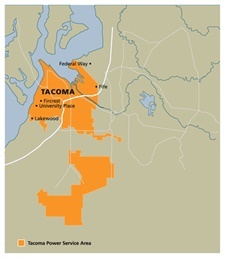 Tacoma Power provides electric service to the city of Tacoma, Fircrest, University Place, Fife, parts of Steilacoom, Lakewood, Joint Base Lewis-McChord and unincorporated Pierce County as far south as Roy. That’s nearly 179,000 customers. View a more detailed map of our territory and others who serve around us. We have been publicly owned since 1893. We are a division of Tacoma Public Utilities and are governed by a five-member Public Utility Board. Tacoma Power also owns Click! Network, which provides telecommunications services such as cable television, broadband and wholesale internet services. Tacoma Power is an innovative, citizen-owned electric utility that generates, transmits and distributes electricity and provides energy and telecommunication services in an increasingly competitive marketplace. We are committed to provide high-value, competitively priced products and services to our customers through the quality of our employees, and the responsiveness that results from local ownership. We will continue to serve our customers in Tacoma and neighboring communities and serve new markets to benefit both existing and new customers. Our power supply is 89% hydroelectric power. Of that, 46% is provided by our own hydroelectric power facilities. Tacoma Power was established in 1893 when the citizens of Tacoma voted to buy the privately owned Tacoma Light & Water Company. Local citizens believed that public ownership and local control would give them a higher caliber of services and the ability to maintain control over them. That decision paved the way for us to build one of the finest and most reliable electric systems in the United States.